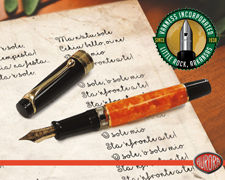 This blog is about fountain pens and all things related to our passion. I started this so I could separate the blog from the Fountain Pen Day site itself. I wanted to ensure that Fountain Pen Day was kept clean, unbiased and without ads or influence. Here I can review and discuss all the things we use on a daily basis in our quest to find the perfect pen, ink and paper combination. I will be doing many reviews that are sponsored and of products that have been loaned to me. I will always specify when that is the case. With that out of the way there will also be just as many reviews of products I have purchased and use regularly. If there is a product you would like to see reviewed please feel free to request it on my contact form.